A reliable infrastructure is the foundation for SMBs and SMEs, allowing them to provide services to customers and improve the daily workflow of their employees. In most cases, IT-staff have to deploy in-house servers and services to have such services, including email and collaboration tools like a messaging platform, file sharing, or company calendar. To squash server and software license expenses, Google provides a GSuite, an all-in-one service for such services. GSuite provides centralized control of all corporate services in organization from IAM to Cloud file storage. Every employee can access their corporate email, calendar, chat, and file storage from anywhere at any time from any device. At Zazmic, our team has extensive experience in provisioning and migrating existing infrastructure services to GSuite. From the beginning, our team analyzes all needs of the client and organization to develop a quick, effective way to establish a comprehensive infrastructure. In the end, our Client receives scalable, reliable services that are easy to use and support. Working with Zazmic alleviates the stress and confusion of having to set up the infrastructure yourself. It also guarantees that you will have an IT-support team, there to come to the rescue whenever you may need. You can find out more about GSuite and our services over on our website. GSuite allows you to easily connect with employees, create, share, and control files sent across the network through a variety of preexisting Google Apps including: Gmail, Google Hangouts, Google Calendar, Google Docs, Google Sheets, Google Slides, Google Drive, and Google Vault. Through GSuite, you can create group mailing lists using your own business addresses for yourself as well as your employees. You can quickly manage email addresses on your network through Gmail, as well. Gmail’s groundbreaking features set it apart from any other email. For example, Gmail uses artificial intelligence software to offer smart spelling suggestions, finish your sentences, and even generate automatic replies based on the incoming email. A Gmail address also serves as the gateway to other Google services that are included in GSuite for businesses. Google Hangouts is an online communication platform that provides text, voice, and video chat services. It eliminates the need to turn to additional third party sources, such as Skype, for easy communication. Google Hangouts is universal. Employees can access it through their GSuite business address from any device and browser, ensuring that everyone has the ability to keep in touch with the rest of the team. Through Google Hangouts Meet, you can host large video or audio conference calls. Google Calendar is a far more in-depth and interactive version of your typical calendar app. It doubles as an effective time management and scheduling system. With Google Calendar, you can keep the team informed and up to date on all upcoming events, schedule changes, and deadlines. Google Docs is an online word processing software that allows you to create, format, and share documents with others at the click of a button. It has the features you would expect from softwares such as Microsoft Word or Pages, with even more features and tools. There are also a few table and chart features that are expanded on even further in the application Google Sheets. With Google Docs, employees can work together on documents in real time. Collaborating has never been easier! Google Sheets is an online spreadsheet software with all the essential features from programs such as Microsoft Excel or Numbers. It works very similar to Google Docs, allowing employees to create, format, and share spreadsheets in real time with ease. It can be accessed from any device and browser at any time. Google Slides is an online presentation software service similar to Microsoft PowerPoint. You can create and share comprehensive slideshows and in real time with fellow employees, who can access it from any browser or device. Google Drive is an essential business tool. It is a Cloud file storage that allows you to share all kinds of files across your organization’s network. You’ll never have to struggle to send files over email or rely on finicky, third-party, file sharing softwares ever again. Although Google Drive initially offers default Google up to 15 GB of storage, GSuite’s Business and Enterprise editions come with unlimited storage. With Google Drive, you can share, edit, and create files from other GSuite services, like Google Docs or Google Sheets. You can also share PDF files, images, audio, video, etc… This makes it incredibly easy to manage your organization’s most important files. Google Vault is a digital archiving service that makes storing, searching, and exporting your business’ data a breeze. It isn’t exclusive just to the files shared through Google Drive, you can also archive emails and chats. Google Vault is safe, secure, and encourages you to create the ultimate archive. As mentioned before, you can take advantage of GSuite’s unlimited storage, so you never have to worry about running out of space for your data. Whether you’re a start up, small business, or corporation, GSuite has so many groundbreaking features and benefits that will propel the productivity of your organization. It encourages easy collaboration and sharing in an all-in-one, universal package. GSuite includes all the essential business tools you need: email administration, messenger services, scheduling, document editing, slideshow presentations, file sharing, and archiving. It cuts out the middleman, eliminates the cost of software licenses, and creates universality. GSuite’s services can be accessed across all devices and browsers online, getting rid of the potential for compatibility issues. 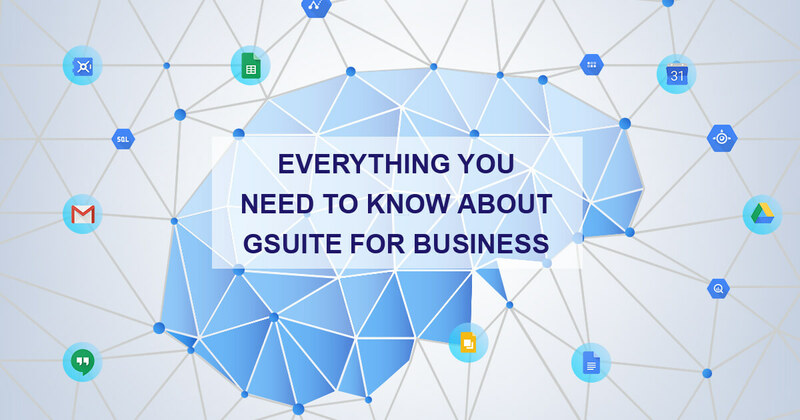 However, you don’t have to embark on establishing GSuite on your own – and you shouldn’t. Our experts here at Zazmic can work with you to create the GSuite your business needs. From setting up emails through GSuite to troubleshooting and advice, we’re here to help you succeed every step of the way. Head on over to our blog for the latest tips and trends in business related IT. If you are interested in learning more information about Zazmic, our experts, or our services, please contact us. We are a San Francisco-based business IT company that will go above and beyond to see your business thrive. Together, we can bring your organization one step closer to success and unbeatable productivity.